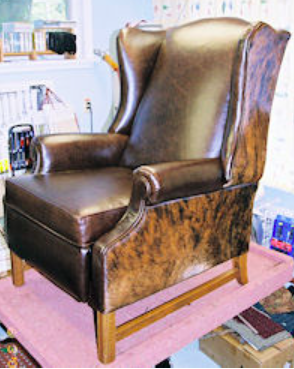 Tufting, channelling, creative combinations, replica styles, and matching are just some of the challenges that keep reupholstery fun and interesting. Sarah earned a Bachelor’s degree in Chemical Engineering in 1992 and went on to work for 3M and the spin-off, Imation, for almost 9 years. 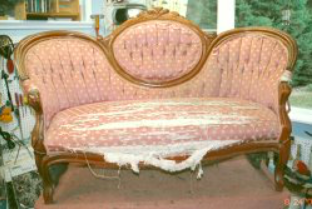 While working full time, she took night classes in upholstery at the Minneapolis Community and Technical College, following a passion for rescuing and restoring antique furniture. Finding that the corporate life was not a good fit for her, Sarah started her upholstery business at home in 1999. She has since started a family and continues to work part time. Having an engineering background provides Sarah with a unique set of talents. She is a dedicated hard worker, committed to quality and precise craftsmanship, with an analytical and practical style in this creative outlet. Sarah enjoys working with clients, helping find the right fabric and style for the project as well as educating about the process and individual piece. She particularly enjoys working with antiques and has had the opportunity to reupholster several pieces for the Minnesota Historical Society’s Burwell House in Minnetonka. The photo top right is of a parlor chair at the Burwell House that Sarah donated labor and materials for. 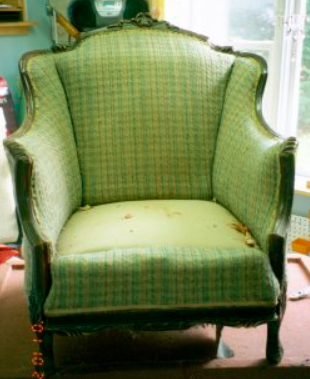 This club chair was found on the side of the road by the client, full of birdseed! The frame was completely refinished and re-glued. The padding was replaced, the cushion was made to fit. Contrasting welt was used to create a more casual feel. 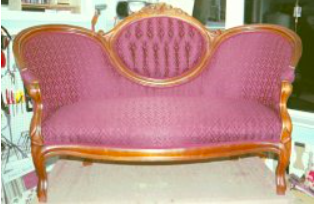 This settee frame was repaired and re-glued. The show wood was cleaned and polished. The padding was re-worked and freshened. 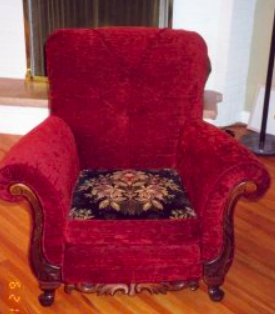 The tufting in the center was retained and the wings were altered to a smooth pulled finish.